Line a baking sheet with rim with aluminum foil; spray with nonstick cooking spray. Melt the butter in a small bowl in the microwave or on stove top in a small saucepan. Remove from heat; stir in the pepper sauce and garlic. Place the shrimp on the prepared baking sheet. Drizzle shrimp with 3 tablespoons of the butter mixture. Broil, turning once, 2 1/2 to 3 minutes until the shrimp are cooked through. Toss in the remaining sauce. 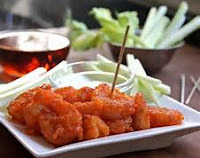 To serve, arrange the shrimp on a serving platter and serve with the celery sticks and remaining butter sauce. Garnish with the lime wedges, if desired.